Reverend Leon Sullivan (1922-2001) founded the Opportunities Industrialization Center in 1964, operating out of an abandoned North Philadelphia jail. He aimed to provide African Americans with the job training they had previously been excluded from to give them a means of self-help. Sullivan was born in West Virginia and moved to Philadelphia in 1950 during a time of increased African American migration to the city. OIC trained and employed many of these migrants as well as long-time residents and eventually expanded to a global enterprise. 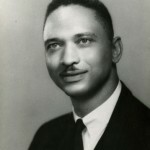 Sullivan's early life as a civil rights activist in the 1940s instilled in him a belief that improved employment circumstances would revolutionize life for African Americans. He spent the remainder of his life trying to build opportunities for the black community across the world. He is known worldwide for the Global Sullivan Principles, a set of guidelines he constructed in 1977 for American businesses working in South Africa under apartheid. 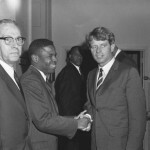 Robert Kennedy visited the Opportunities Industrialization Center's headquarters at Nineteenth and Oxford Streets in 1966. 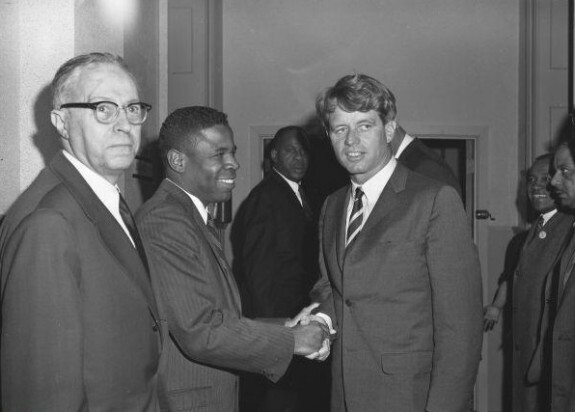 Kennedy, a New York senator, was well known for his support of the civil rights movement, and with his help OIC was able to become a national program. Two months after Kennedy's 1968 assassination, OIC became the subcontractor of a new program in the Bedford-Stuyvesant neighborhood of Brooklyn, New York. Through this program, 1,200 people were trained and educated and, in its first year, 14 new black-owned businesses were opened in the neighborhood, creating 570 new jobs. OIC continued to expand into the global network of training programs that exists today. 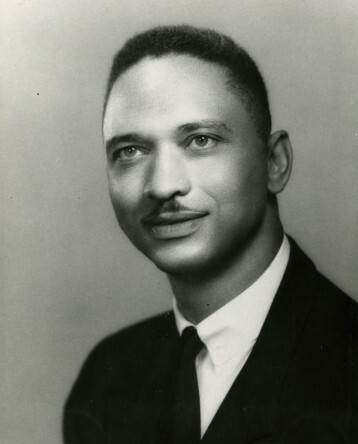 In the 1960s, after leading protest campaigns to expose discriminatory hiring and open thousands of jobs to African Americans, the Reverend Leon Sullivan (1922-2001) founded the Opportunities Industrialization Center (OIC), a vocational, educational, and life skills training program designed to prepare young men and women for full-time employment. Moving beyond protest to address the barriers of poverty and oppression, the OIC quickly expanded into all corners of the city and ultimately grew into a national and international movement that trained millions of workers from all racial and ethnic backgrounds. The OIC first opened its doors on January 26, 1964, inside a refurbished jailhouse at Nineteenth and Oxford Streets. The building, emblematic of the area’s urban decay, became a potent symbol of hope in North Philadelphia. The OIC’s skeleton-key logo promised “To Open Any Door” and proudly proclaimed Sullivan’s self-help motto, “Helping People Help Themselves.” Trainees started in the “Feeder Program,” which sought to eliminate the stigma of remedial education by confronting the candidates’ learned sense of racial inferiority. Students took courses in African American history to develop a deeper appreciation for their heritage and to cultivate a new sense of self-esteem, identity, and pride. Building on this newly fortified base, students received supplemental instruction in communication skills, basic reading, writing, arithmetic, consumer education, interpersonal relationships, and personal hygiene. Candidates then progressed to the OIC Technical Skill Center for training in a wide variety of manufacturing jobs. Sullivan extolled the virtues of OIC trainees, negotiated with businesses to hire them, and cultivated additional financial and instructional support from corporate leaders. OIC’s early years were challenging. Funding came from a patchwork series of donations from parishioners at Zion Baptist Church. At one point, Sullivan and his wife, Grace (1924-2011), took out a loan against their home to make payroll. Ironically for a self-help program, a massive infusion of federal and philanthropic funding helped stabilize and expand OIC beyond Philadelphia’s borders. In March 1964, a $200,000 grant from the Ford Foundation provided vital funding. In December, OIC received a $458,000 grant from the Department of Labor to administer job training and education programs. In the summer of 1965, OIC won the support of Lyndon Johnson (1908-73) and his War On Poverty and received a $1.7 million dollar grant from the Office of Economic Opportunity (OEO). In 1966, the OIC National Institute was developed to coordinate activity between branches and to oversee the program’s expansion. In a well-publicized visit, Senator Robert F. Kennedy (1925-68) extolled the virtues of combining public and private monies to stimulate economic development. He later helped incorporate an OIC branch into the Bedford-Stuyvesant Restoration Corporation, the nation’s first federally funded comprehensive community development corporation, in Brooklyn, New York. A $16.8 million federal grant in 1967 opened twenty-four new centers across the nation. By 1968, the potent combination of federal, philanthropic, and private funding increased service to 150 cities. Later that same year, the first international branches of the OIC were established in Nigeria, Ghana, and Ethiopia. By the early 1990s, OIC International supported twenty-nine centers in seventeen countries. With OIC as a cornerstone, Sullivan’s “Progress Movement” sought to drive a wedge into the capitalist system and open new opportunities for African American self-help, self-improvement, and entrepreneurship. To spur this new era of black enterprise Sullivan created the Zion Investment Association and the Zion Non-Profit Charitable Fund to confront the deep structural inequalities of the economy. OIC graduates easily found work in one of several subsidiaries. The Progress Plaza shopping mall on North Broad Street helped develop black-owned businesses while providing new jobs and services for the community. OIC graduates took to the factory floor of Progress Aerospace Enterprises, where they developed components for a General Electric defense contract. OIC-trained seamstresses working at the Progress Garment Manufacturing Company produced textiles for national firms. Employees at Progress Products manufactured auto parts for General Motors. Seeking to redress inner-city housing segregation, Sullivan purchased an apartment building in the predominantly white neighborhood of Oak Lane and later built the Zion Gardens and Opportunity Towers apartment complexes. These were the first in a series of new housing options designed to support those with physical disabilities, limited incomes, the homeless, and the elderly. Sullivan’s bootstrap rhetoric emphasized traditional American themes of self-help, which were warmly embraced by white conservatives seeking alternatives to the social programs of the Great Society. During the late 1960s and early 1970s, Sullivan navigated the nation’s shifting political crosswinds as he touted the value of the OIC as an important incubator of black capitalism. President Richard Nixon (1913-94), deeply enamored of Sullivan’s success, pledged his personal support during a campaign stop in 1968. Once elected, Nixon renewed the Johnson administration’s support for the OIC and secured additional funds to foster commercial development in black communities. Later, when Nixon’s “New Federalism” threatened to replace dedicated funding for the nation’s anti-poverty programs with block grants administered by the states, Sullivan and his allies in Congress worked to ensure that OIC would remain a national contractor for manpower training programs. A $32.6 million grant in 1973 and a $44 million grant in 1974, under the Comprehensive Employment and Training Act (CETA), allowed OIC to prosper at a time when other anti-poverty programs were terminated. Sullivan’s attention shifted away from OIC in 1971 when General Motors named him as its first African American board member. Using this platform, Sullivan began a decades-long struggle to deploy the Global Sullivan Principles as a tool to end apartheid in South Africa. This shift in priorities coincided with new federal guidelines that decentralized OIC’s management structure. The combined forces of deindustrialization, the slumping U.S. economy of the 1970s, mounting debts, and deteriorating relationships with local businesses served to weaken the OIC. The anti-government platform of President Ronald Reagan (1911-2004) ended support for social programs and forced OIC branches to secure new revenue. The lean years of the 1980s and 1990s served as a crucible, forcing OIC to close some branches, reorganize others, institute new financial controls, and adapt its training programs for the hospitality and service sector workforce. Internationally, OIC programs served as the vanguard for Sullivan’s development work in Africa. The OIC model blended Sullivan’s Baptist faith, the protest techniques of the civil rights movement, and economic empowerment concepts espoused by Isaiah Montgomery (1847-1924) for a free black colony, Booker T. Washington (1856-1915) for the Tuskegee Institute, W.E.B. DuBois‘ (1868-1963) advocacy of cooperative economic development strategies, and Marcus Garvey (1887-1940) for a nationalist investment program. These forces continued to unfold throughout the 1960s in the Poor People’s Campaign of Martin Luther King Jr. (1929-68) and A. Phillip Randolph (1889-1979) and in the Freedom Budget for All Americans of Bayard Rustin (1912-87). Critics have contended that the OIC’s focus on individual transformation reinforced ideas central to the “culture of poverty” thesis, which argued that personal irresponsibility contributed a subculture of helplessness and dependency. Others suggest that Sullivan was more successful at positioning himself as an elite power broker than he was at undermining unjust economic structures. However, Sullivan was more than a conservative apologist for American capitalism. In the early decades of the twenty-first century, OIC remained one of the nation’s most successful job training programs as well as a fixture in North Philadelphia. Its development marked an important moment of transition in the northern civil rights movement away from protest and toward a new form of corporate Black Power. While the liberal interracial coalition of the 1960s failed to create a color-blind society, the OIC-Progress Movement demonstrated the strength of African Americans to resist persistent racism and discrimination through the power of their own churches, communities, and institutions. OIC employment training and industrial development programs demonstrated the power of community-based organizations to transform federal policy, confront structural inequality, and promote economic security as a core component of the civil rights-Black Power movement. Even after his death from leukemia in 2001, Sullivan’s vision continued to animate the OIC’s mission to support people from all communities and all neighborhoods as they sought to climb the economic ladder. Jason T. Bartlett holds a Ph.D. in history from Temple University. His dissertation, “The Politics of Community Development: A History of the Bedford-Stuyvesant Restoration Corporation,” examines the fifty-year history of the nation’s first comprehensive community development corporation. Research Unit, Wharton School, University of Pennsylvania, 1976. Countryman, Matthew J. Up South: Civil Rights and Black Power in Philadelphia. Philadelphia, Pennsylvania: The University of Pennsylvania Press, 2006. Michael Ezra, 137-153, New York: Routledge, 2013. The Journal of African American History Vol. 96, No. 1 (Winter 2011): 44-61. Philadelphia. Chicago, Illinois: The University of Chicago Press, 2008. Forge, Pennsylvania: Judson Press, 1998. Opportunities Industrialization Centers, Charles L. Blockson Afro-American Collection, Temple University, 1330 Polett Walk, Room 7, Philadelphia. Opportunities Industrialization Centers (OIC) of America and Opportunities Industrialization Centers International Collections, Urban Archives, Special Collections Research Center, Temple University, Samuel Paley Library, 1210 Polett Walk, Philadelphia. OIC of America, Leon H. Sullivan Human Services Center, 1415 North Broad Street, Suite 227, Philadelphia. Hello, my name is Erica Akins, and I am researching metropolitan Atlanta Opportunities Industrialization Center. I completed the required course of study for COMPUTER EDUCATION, ON DECEMBER 12, 2000. The President was John A Craslan, and the board Chairman was Dr. Pat Johnson. The location was right off of The Turner Field, exit. This is the only information that I have, due to my lost of memory, after the tragic under of my sister, Tshenerka Smith in Atlanta,GA, on VALENTINE’S DAY 2/14/2010 of off Cleveland Avenue, near I-75. I need the information, because I want to write a book on my Life. Any information that you have to help me on my journey, will be greatly appreciated.